On our Yellowstone Winter Tour g‍‍eyser basins and snow-covered landscapes await in the winter wonderland. Winter is a fantastic time for wildlife watching and your guide will take you to the best spots to see bison, elk, bighorn sheep, and possibly even one of the resident wolf packs. We will board special snow coaches that will transport us over the closed roads of Yellowstone to Old Faithful. Once there try out a pair of snowshoes, put on some cross-country skis, or simply walk the boardwalks right from the lodge. Capping off the week is a dip in a hot spring steps away from your cozy room. Not an ordinary Springhill Suites, this hotel was custom built for Bozeman that features studios with a semi-divided living and sleep area, workspace, pantry with microwave and mini-fridge, sofa sleeper, plush bedding, and a flat-screen TV. Enjoy a dip in the heated indoor pool, get a workout at the fitness center, grab a drink at the bar, or stay connected with free WiFi. Located steps away from the limestone terraces it is named after this hotel was built in 1936. The hotel was recently renovated but still has a very historic feel included the famed map room with a map of the United States constructed from 15 different woods from nine countries. Located in the northern part of Yellowstone it provides a perfect location for exploring the park. From this snowy haven elevated at approximately 7,300 feet, you can set out on a variety of explorations from snowshoeing to cross-country skiing to walking the boardwalk in the Upper Geyser Basin. After a day of adventure enjoy the fire as you sip a hot beverage in the lounge, while the snow falls outside. In the heart of Paradise Valley just north of Yellowstone this hotel sits right below the Absaroka Mountain Range. With natural hot springs feeding two pools a few steps from your room this hotel makes for a great ending to a Yellowstone tour. This evening we will gather for a welcome reception and group dinner to get you oriented to the week ahead. We follow the Yellowstone River as we head south along the Old Yellowstone Trail with possibilities to see pronghorn and bison before passing through Roosevelt Arch on our way to Mammoth Hot Springs. In the afternoon we walk the Lower Terrace and those who are looking for a bit more adventure can walk or snowshoe the Upper Terrace. Keep your camera ready as you never know when a resident elk will make a visit to warm themselves at the thermal springs. Our day is devoted to wildlife viewing in the snow-covered Lamar Valley. 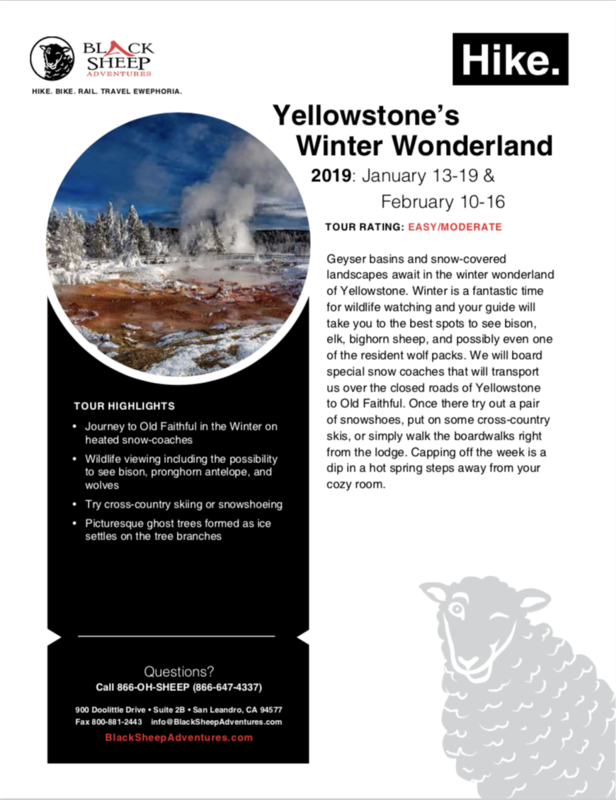 The guides will get their spotting scopes out to get a better look at the resident bison using their heads to shove away the snow to get to the grass below, bighorn sheep on the cliff sides, and the gray wolves out hunting to survive the long Yellowstone winter. We will enjoy lunch in Cooke City just beyond the eastern entrance to the park to get a taste of local life. Taking our time to spot more wildlife this afternoon will be the plan and depending on time you could get in a short hike or snowshoe as well. A special treat of Yellowstone in the winter are the heated snow coaches which allow us to traverse the roads closed during the winter in the Southern half of the park. Mid-day we will stop at the Grand Canyon of Yellowstone to take in the spectacular sight of Yellowstone Falls frozen over. Along our drive we will likely share the road with herds of bison, see playful otters, and catch a glimpse of trumpeter swans. After dinner we will bundle up and enjoy an eruption of Old Faithful which is made even more dramatic in the winter with the hot water hitting the frigid air. This morning we explore the boardwalks surrounding Old Faithful and over 20 other geysers to get a sense of the power under the surface of the park. The geysers provide another unique site in the winter, the Ghost Trees, covered in icicles and swaying in the winter wind. In the afternoon, explore the winter wonderland around you by choosing to hike, snowshoe, try out a pair of cross country skis, or simply relax by the fireplace at the lodge.